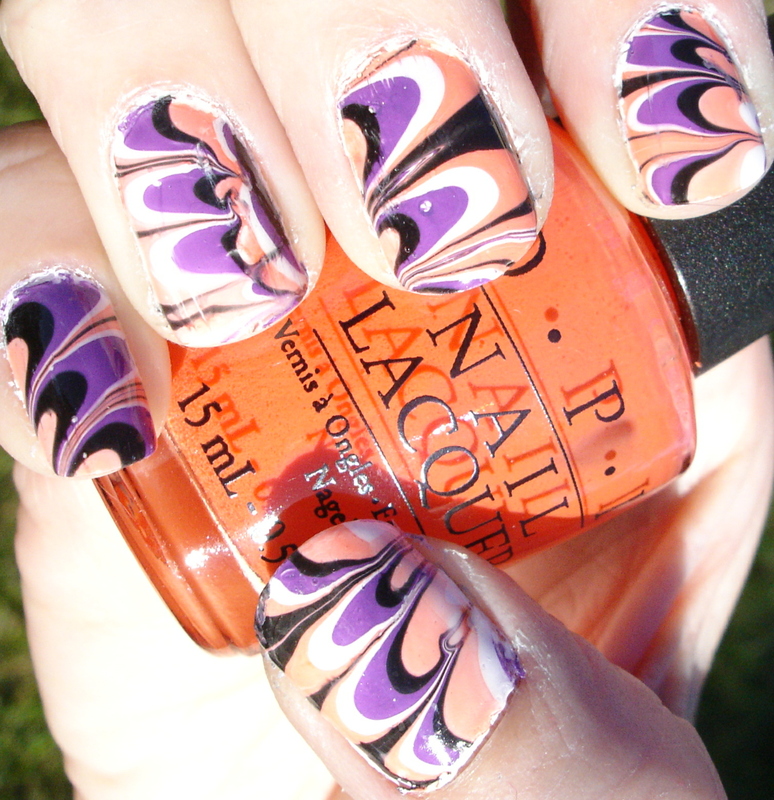 Last night I got the inspiration to try water marbling again - and I think it turned out fairly well this time! Yay, I actually managed to come up with somewhat of a uniform pattern this time! I tried to alternate the direction of the swirls for something a bit more interesting. Overall this marbling went well - still some air bubbles, I need to work on that in the future. For this marbling, I started off with two coats of Sally Hansen Xtreme Wear White On as a base on the nails. Then I used Sally Hansen Xtreme Wear White On, OPI Funky Donkey, Sally Hansen Xtreme Wear Black Out, and OPI Brights Power for the marbling effect. The orange did pale up a bit, looking almost a peachy color, not quite the bright orange that you see in the bottle. But it is still fun, and still very Halloween-y, I think! This afternoon as I was sorting through my polish collection, I got the urge to try a new sparkly glow-in-the-dark over this. It is a lot of fun! Unfortunately, I can't seem to get any good pictures of it glowing in the dark, so I can't show you that feature, but it is pretty cool. I am really pleased with this water marbling attempt, I think it turned out quite a bit better than the last couple of times! 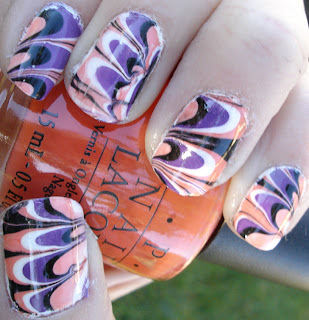 Even my sister Becky, who didn't really like water marbled nails before, told me this was pretty cool. I think it is a really fun and interesting technique, and I will keep practicing and hope to improve even further in the future! i like this color combo a lot! purple and orange look great together! Great job and amazing colors! Hi! I'm a fairly new follower, and I am SO, SO glad to have found you! You decorate your nails (and not just paint them)! Hurrah!